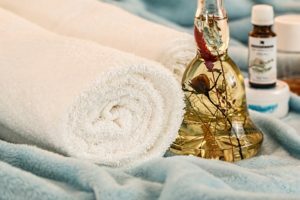 This “Aroma Therapy” massage entails heavenly organic essential oils dropped on the spine and massaged in to help reduce stress, release negative emotions, improve circulation, reduce inflammation and pain, as well as detoxify the body. Raindrop Therapy is also used to relieve colds and flu symptoms as it has been noted as a means to strengthen the immune system. We all carry viruses and bacteria which deplete our immune system. During Raindrop Therapy, the body naturally absorbs pure oils, creating an environment less hospitable to bacteria, viruses, or other unwelcome micro-organisms. The objective is to open the neuropath for greater flow of oxygen. With this sequence of combined oils, viral agents are destroyed, inflammation is reduced, and the process of self-healing is stimulated. The essential oils are anti-infectious, highly analgesic and anti-inflammatory. As a result, they sometimes continue to work in the body for several days after a treatment, with continued positive, analgesic effects taking place during the entire time.